Shortbread is a great cookie anytime of the year but top it with peppermint bark and, suddenly, it is on top of the make-now list for Christmas cookies. 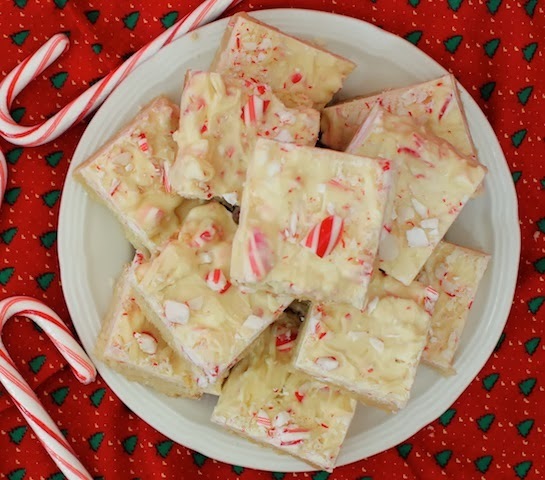 Peppermint Bark Shortbread! What could be better? Preheat your oven to 325°F or 163°C and line your 8x8in or 20x20cm pan with parchment paper. Melt your butter in a small saucepan and allow to cool. Combine your flour, cornstarch, baking powder, sugar and salt in a medium-sized mixing bowl. Stir well. Pour in the melted butter and mix until you have a soft dough. Press the dough into your prepared pan and bake for 30-35 minutes or until lightly golden around the edges. Put your peppermint sticks in a Ziploc bag and shatter gently with a small hammer. You don’t want to crush them completely. Meanwhile, put your white chocolate in a microwaveable bowl and melt in the microwave by zapping 15-20 minutes each time and stirring well in between. Once the white chocolate has softened mix in the pinch of salt and all but a small handful of the crushed peppermint sticks and stir well. Spoon the white chocolate/peppermint mixture on top of your almost cooled shortbread, spread it around and smooth it out. Sprinkle on the reserved small handful of peppermint shards. Allow to cool completely and almost harden before cutting into squares. 2. 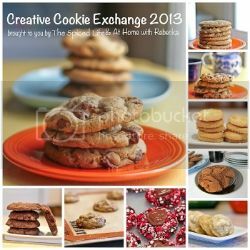 Post the Cookie Exchange badge somewhere on your blog so others can join in the fun. 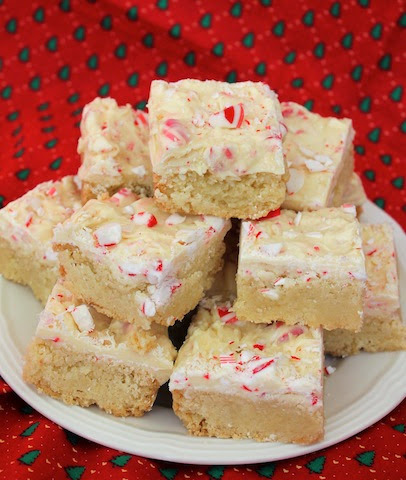 I LOVE peppermint bark and the thought of combining it with shortbread is genius! What a great idea to mix these two favorites together. Great photos too! Total perfection. Love shortbread and love that you topped it this way! Amazingly gorgeous! You KNOW I'm coo coo for your shortbread but to add peppermint to it? Oh MY! You can just send that on to my home address. Thanks! :) hahaha! It looks and sounds fantastic! You always come up with the most wonderful recipes! Oh, YUM! 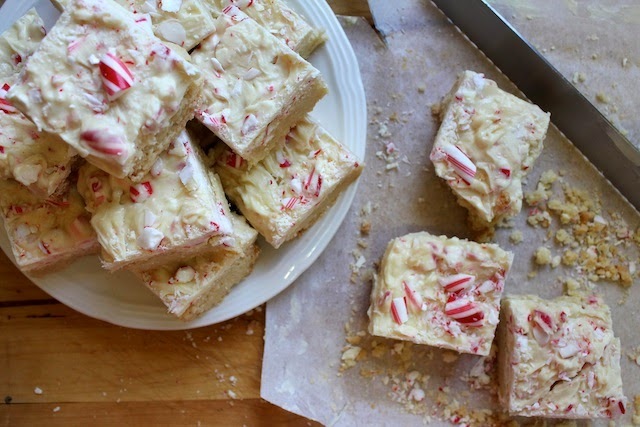 Peppermint bark over shortbread??? Love this! These are two of MY favorite things!!! I love shortbread and that thick layer of it is calling my name!